The power of social software is undeniable in the free, anarchic world of the global internet. But what happens when you bring these tools into the constrained, policy-driven, risk-averse world of the corporate intranet where the user population is small, where expressing oneself as an individual and on a personal level can feel threatening, and where management is watching your every move? Well, that’s just what one of the world’s leading providers of communications solutions, BT, has chosen to do. Richard Dennison, BT’s Internal Programme Manager, tells the story. It was inevitable that the unprecedented and explosive growth of social media tools on the internet would eventually start to seep through firewalls onto corporate intranets. However, reading the increasingly negative stories in the media about employees ‘wasting time’ on social media sites such as Facebook, one could be forgiven for thinking that they are an evil to be resisted at all costs, transforming focussed and highly productive employees into a morass of lazy, good-for-nothings who spend their days competing with one another to collect the most cyber-friends. At BT, we take a different view. While some companies begin the impossible task of shutting out social media tools, at BT we have just completed a web ‘liberalisation’ project to make sure all our employees can access social media sites. Why? Because we see social media tools as a huge opportunity to transform the way our employees interact with each other, with ‘the company’, and with our customers, partners and suppliers. When over 4,000 of your employees voluntarily join a Facebook group called ‘BT’, it’s time to take note. Having taken the ‘philosophical’ decision that we should use these tools internally and externally, the first step was to persuade the HR, security and legal policy makers that we weren’t about to open a can of worms for them. That’s where we made our first mistake. Initially, caught up in the hype surrounding these tools, we began shouting from the rooftops that the world was about to change, that these new tools would effect a seismic shift in everything we did. Unsurprisingly, the policy makers ran a mile! Being the people in the business who are often left to pick up the pieces, HR, legal and security policy makers are understandably cautious. Having calmed ourselves, we took a different and probably more realistic approach. In reality, these tools are not actually ‘new’. They are, in essence, simple content management systems. What makes them different from their predecessors is that they are intuitive, simple, offer no technical barriers to participation, reflect social behaviour rather than try to distort it, and crucially have become incredibly fashionable. So, we went back to the policy makers and explained this more clear-headed perspective on what we wanted to do. Together we looked through our existing policies around use and abuse of the internet and intranet and found that the use of these tools was actually pretty well covered by existing policies already. This went a long way to confirming our suspicions that these tools were not as new as the hype suggested and gave the policy people much more confidence. The final reassurance was that we agreed that all tools that allowed user-generated content would be behind our single-sign-on application to prevent any anonymous publishing. The ethos we would engender was one of allowing BT people to say anything they want, in the knowledge that they would be held accountable for what they say. The final policy hurdle was persuading the BT Communications Council, made up of the directors of internal and external communications from around the business, that letting BT people say what they want internally and externally was a good idea. 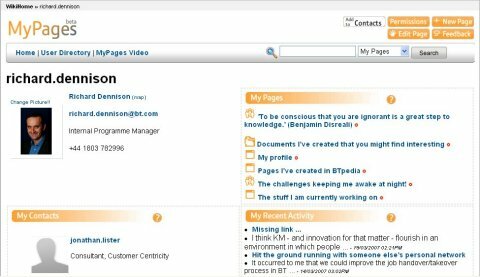 In August 2006, approval was given for all internal activity, but the main stumbling block was whether or not to let BT people blog externally about the company and their work. Initially, the proposal was rejected outright. We agreed to a nine-point action plan that involved things like: reviewing who in BT was already blogging; what the blogosphere had to say about BT; and what peer organisations were doing. In January 2007, we returned to the Communications Council with our findings and the external blogging proposal received a warmer reception. The balance was finally tipped by Ben Verwaayan, BT’s chief executive, who expressed publicly his support for the more liberal approach. The policy was approved. In parallel with negotiations around policy, we released some pilot social media tools quietly on the intranet. We didn’t publicise their existence but let people find them and the news of their presence spread virally. The tools were based on a single platform, called JotBox, which was cheap to buy and easy to customise. Our view was that these tools would take off or wither away based on how useful they were to BT people. Whatever the outcome, we would have succeeded or failed quickly and cheaply. 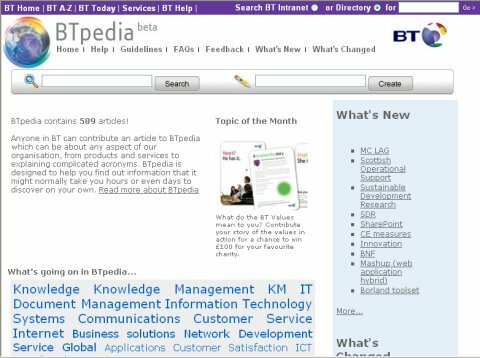 The tools we launched initially were an enterprise-wide wiki called BTpedia (see figure 1), based on the concept of Wikipedia, which allows any BT person to publish articles or edit articles published by others. We also launched a blogging tool. Both were well received and within a matter of weeks we had several hundred articles in BTpedia and around 300 blogs. However, the ‘killer application’ was a social networking tool we called ‘MyPages’. MyPages (see figure 2) provided every BT person with a place on the intranet to call their own. In it they could: create web pages and allow others to edit them (wiki pages); set up photo sharing pages and file stores; set up wiki calendars; create as many blogs as they wished; and connect themselves with other people in the organisation through ‘friends’ type functionality. The fact that individuals could manage all this functionality through a single ‘portal’ was incredibly powerful and sent adoption rates through the roof. With only viral marketing, within a couple of weeks over 1,500 people had activated their MyPages. Activity and traffic on this tool was so heavy that it sent the JotBox into meltdown and all our social media services disappeared overnight! It’s ironic that the thing that social media is best known for, namely simple and cheap technology, is the one thing that we have struggled with most. We had to switch off MyPages to keep BTpedia and the blogging tool open. The company that created the JotBox was bought by Google, who announced they would no longer offer it in the way in which we were using it, effectively making it a legacy product overnight. And, because the JotBox was brought into BT ‘under the wire’ without following correct IT procedures, we couldn’t buy the extended capacity we needed to keep it going on a sustainable basis. For the last six months we have been through a process known in social media circles as: ‘throwing technology at the wall to see what sticks’! A significant change in policy by our IT department to embrace OpenSource technologies threw open the flood gates of technology options open to us. Consequently, we will be migrating information off the JotBox into a number of different tools ranging from WordPress, Mediawiki, and Confluence to SharePoint 2007 over the coming months. It seems inevitable that there will always be a degree of friction between the need for robust IT processes to safeguard customer and business data and to effectively manage IT spending in a global corporation like BT, with the need for technical agility and to support the concept of the perpetual beta in which you try out quickly and cheaply often competing technologies and let users iterate and adopt as they see fit – ultimately, letting the users write the business case for adopting a particular option. Trying to reconcile these often competing needs is a tricky and ongoing process within BT. So what impact has the introduction of these tools had on our intranet? The impact has been significant in some areas, subtle in others and in some cases has had no impact at all. Some of the major changes are outlined below. Our internal communications consultants have had to accept that in some cases they will have to relinquish control of messages which become subject to community ownership and community editorial control. They are also increasingly having to conduct their business in channels they don’t own and cannot control, such as employee blogs. Communications is becoming a ‘conversation’ rather than a managed activity which requires a different type of engagement by those traditionally responsible for communications activity. Intranet responsibilities are subtly shifting between those responsible for intranet management and intranet users (see figure 3). For example, six months ago information retention policy was a relatively simple policy to enforce. Content was owned by individuals and those individuals were responsible for managing that content through its lifecycle. Today, more and more content is produced and owned collaboratively. With no clear ownership, who manages a piece of community-owned content through its lifecycle and ensures it is deleted or archived appropriately? In addition, what information governance model do you apply to organic, user-generated content. Information consumption behaviours on the intranet are changing too. With increasing amounts of unstructured user-generated content appearing in disparate channels on the intranet, the challenge for users in finding and extracting value from that content increases exponentially. To help users find and keep up to date with new content, we are using a combination of ‘tagging’, where publishers and users attach key words to content which are then searchable by others, and Really Simple Syndication (RSS), where content is published into appropriate feeds to which users can subscribe for updates via a feed reader client on their PC or via an RSS server. Without RSS, the value of social media content would be very limited indeed. However, this does require both publishers, whose target audience may never actually visit their site but read content in their feed readers, and users, who are used to viewing structured content on the sites upon which it is published, to behave in very different ways. Perhaps one of the most positive impacts has been in the area of accountability. Management and communications teams are having to be much more end user focussed as the employee channels provide a perfect platform to hold them accountable for what they say. Contrary to popular opinion, these channels are being used in a constructive and positive way. To date, BT people have responded responsibly to being trusted with channels into which they can publish anything they like. By and large, BT people enjoy their jobs and are not prone to throwing them away gratuitously for the sake of it! We’ve learnt a lot on the bumpy social media ride to date and have bruises and accolades in equal measure to prove it. A key lesson is to focus on the value social media tools can deliver rather than the risks. If you dwell too much on the risks, you’ll never leave the starting gates. There are risks, but the potential benefits are huge. Many believe that trying to stop social media tools seeping onto intranets is a futile activity anyway, so it is better to introduce them on your terms in a managed way. Our experience suggests that it is better to start small with simple and cheap tools with limited functionality. Let users dictate the direction and speed of adoption. Allow users to dictate how they are going to derive value from new tools and don’t be afraid to shut down applications that are withering on the vine. Let users play with new tools as soon as possible, warts and all. We positioned all our social media tools are ‘beta’ applications when they were first released to set the right user expectations. Engage the policy makers as early as possible. Emphasise that these tools represent an evolution rather than a revolution in the use of the web. After all, it’s just another form of content management. Finally, have realistic expectations about what you can achieve – the intranet and the internet are different beasts. Much of what makes social media successful on the internet does not directly translate to the corporate environment. For example, a cornerstone of social media on the internet is the concept of the ‘wisdom of crowds’ – i.e. if you have a large enough body of people collaborating on a single topic, you will distil the ‘truth’ from them. Does the wisdom of crowds work with a smaller population of people, or will the result be unbalanced opinion rather than ‘truth’? The demand for social media tools by employees to support their work is growing apace. While it is too early to measure the impact of introducing these tools into a corporate environment, our experience to date has been very positive. As well as meeting the needs of today’s workforce, we are mindful of the needs of those entering the workforce over the coming years – so called Generation Y – for whom this technology is second nature and an important part of how they interact and manage their time. The extent to which a company adopts user generated tools is bound to become a barometer of company culture for those looking for suitable employment in the future. Thanks for the great case study! As I work in the same industry, I found it very interesting and sounding very familiar. In our environment, we’ve been able to leverage the “wisdom of crowds” from a ‘predictive markets’ & idea management perspective but compliment it with “expert” analysis. Really interesting case study. Would you be prepared to do an interview for our site http://www.simply-communicate.com We’re read by 15,000 corporate communicators? Yes – I’d be happy to take part in an interview … I’ll drop you a line. Dennison – you’re a media tart…. whatever happened to driving over lemons…. How’s it going down-under … looking forward to Xmas Day on the beach? Thanks for the interesting case study. I work at Lloyds TSB and we are exploring the capabilities of social media and it’s applications the workplace. It would be great to speak to you sometime about your experiences and learnings at BT. I’m really glad it was of interest … I’m more than happy to share some experiences. I’ll drop you a line. That’s an excellent post. I work for Reuters in Development Collaboration where we’ve been experimenting with social media technologies. Would you be interested in meeting with us to share some experiences? Andy – sure … I’ll drop you a line separately. Great case study. There are too few of this detail currently shared in this research domain, this is a great resource for any ‘colaboration champion’ getting started. I am currently researching my MSc (Knowledge Management) dissertation, a part of which is an implementation of the Confluence Enterprise wiki in a large bank (23,000 employees) here in Ireland. Would love to share some experience with you if you were interested. This is an excellent example to share with clients who may be risk-averse to social media in the corporate environment. BT’s approach is refreshing! Thanks for the success story. Our company (a technology consultancy) sponsors VanUE, a monthly user experience speaker series in Vancouver, BC, Canada. If you are in the ‘hood, let us know and I’m sure you’d find an audience for your case study. Thanks for sharing your experiences and particularly for telling it as it is – warts and all. It is very refreshing to read an honest assessment about how adoption has gone in a major blue chip company. I appreciate you have a lot on your plate – but wonder if you could spare the time for a discussion/interview. Our internal magazine is running a special section on Web 2.0/Enterprise 2.0 and it would be great if we could interview you as part of it. Thanks for all the offers of sharing info – unfortunately, I’m having to get tough with requests as I am horribly over-committed – I have, until now, been a bit of a push-over when these requests come through but I am finding it a bit of a strain on my limited time. Sorry about that … happy to share through this blog but, for the moment, I’m going to have to restrict it to just that. I was one of thh first webmasters in BT (i worked on project SWIFT) and the first Tube Map of BT Webaservers was my idea. As a social software evangelist it’s always a pleasure seeing best practices and success stories of companies seeing the business value of Enterprise 2.0 – well done!! I’ll be sure to pass your best practice along. I’d love to hear more about the solution you implemented – it looks like self-developed, is it? or have you opted for a proprietary solution? Good article and one that I identify with for sure. When looking at Open source Web 2.0 social networking tools I can understand your reasoning when you say “start small with simple and cheap tools with limited functionality” but would like to better understand the reasoning behind the final choice of mixed tools. All of the functionality as you describe above could have been provided through two Web 2.0 tools designed to link tightly together namely “Connections” and “Quickr”. Both of these can be surfaced and integrated in to Sharepoint and well as JSR based Portal frameworks. Another great read. I am particularly interested in the application you refer to as “MyPages”. It appears that this was a function of JotBox (if not then what? ), but what are you using as a replacement for the functionality (if anything)? We are deploying social networking functionality as part of our portal (status updates; newsfeeds; colleagues (friends); group/skills pages) in June – it’s a bespoke development which will actually be better than MyPages which went into melt-down becuase of over-use which sank the Jot server. SharePoint MySpace is available in my organisation. Have you looked at this tool? If so, what led you to a different solution? Yes we did look at it – but it doesn’t do all we want and also SharePoint is currently not a central tool in our collaborative toolset – it sits somewhat on the sidelines and would therefore not really be an appropriate platform for our enterprise social network. Great article, thanks a 10**6 as we used to say at geek camp. Is video a big part of your intranet delivery? Any use for feedback or interactivity? Is video inherently more interactive than text – or perhaps less so as the user generally doesn’t have the ability to respond in the same medium? Really useful post; having worked with a small (so far) number of companies who have implemented internal networks and blogs, it was ‘amusing’ to hear about your internal discussions. Moving data must have been an interesting time! I do agree with the ‘start cheap’ option as the technology options change so quickly. Not managed to find an OS network but sure it is only a matter of time although platforms such as Ning are pretty good and low cost; not tried migrating from it yet though. Most networks we have looked at are US vendors so sure the UK will catch-up in time. Fred – we are re-launching our Podcast Central service to be more video focussed (more like YouTube inside) … Podcasts haven’t really taken off as much as the other stuff – I think people see the value of video more easily than podcasts … and they’re much more fun! We have an internal video library but this tends not to be user generated but more professional stuff created by comms managers. Thanks for sharing. It’s a valuable post to me. I’am particularly interested in better understanding how did you convince top managers about the potential benefits of social media adoption. Could you write something about? Thanks for publishing your case study – very interesting. We’ve done a few similar things for our corporate clients, generally using Sharepoint (MOSS2007 version) – however it is meeting business needs which is the most important issue rather than necessarily the choice of technology. Some interesting ideas there which we would consider for some of our future developments. Is there anything much you can point me to about BT and EXTERNAL social media activity? In other words, how has BT engaged the blogosphere and generally adopted a social media marketing/communications strategy? What are the lessons learned there? External use of social media is something we are looking at now – we don’t have anything practical to share yet. Pingback: Beeline Labs » Blog Archive » How do you overcome legal obstacles to social media programs? Thanks Richard for the great case study – awesome work! I’m currently trying to evangelize the need for Social Media within my company and over the last 8 months we have started introducing the use of Social Media tools both internally and externally with great success. It hasn’t been an easy road but if you continue to be persistent and have senior management buy on you can change old school communication thinking. Hi Richard, I was told by Clive Shepard of elearning network that BT has some interesting developments around a BT ‘youtube’ abit like what Sun has developed. If you know anything about that I’m all ears. I was wondering if you’d like to join us at our event running on 7th May 09 in London – focused on the next step up from online training and comms to more immersive trainign and comms using virtual worlds, games etc in addition to social networks (and more standard assets and interactions). and in the interests of adding value back to your friends here, we would love to offer a 10% discount – code is MMO10 Hope that is of interest. I am also doing some research into this area – and I can make it available to all sometime later in the Summer. This was a fantastic read for me. I’m interested in starting my MSc dissertion and in this area. I want to research on the possible widespread adoption of web 2.0 tools by organisations in Africa. First off though, there seems to be a general interchange in the use of these 3 terms; web 2.0, social media and sometimes enterprise 2.0. I would have thought that what you have in BT can be termed enterprise 2.0 seeing that it is the use of web 2.0 technologies within the enterprise, yet it is refered to as social media. Can you help me out with a clear difference between the 3. I would also very much like to hear back from you on your experiences so far. Great article Richard – even though it was written over 2 years ago, its relevance today remains current. Great to see so much insight on the cultural barriers of implementing Enterprise 2.0 – too much information seems to focus on the technical barriers. I’ve taken your lead in my own blog article (http://howardthain.wordpress.com/2010/03/26/sharepoint-enterprise2-0/) which focusses on how we’re meeting the cultural challenges with one of our own clients. Nice examples of web 2.0 tools with different case studies.